The grief process is a funny business. 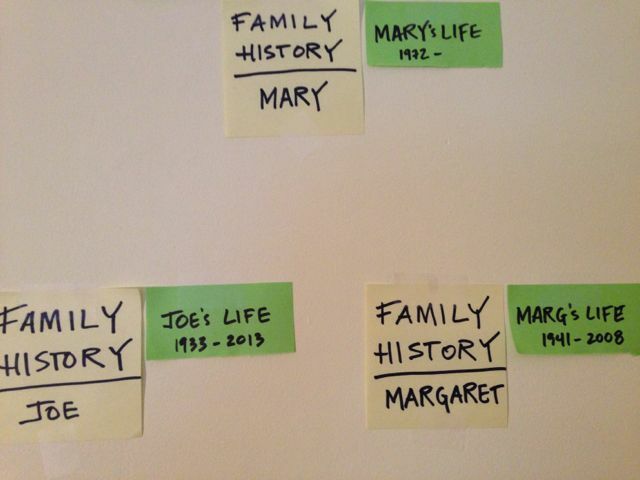 So very sad am I to again accept the fact that my parents are dead, as I write with love their first names on post-it notes and stick them on the wall. Today I spent solo-session time (unexpected because of a major snow storm, 3 hours) creating meta-labels in our study room. The “Family History” wall will help me and others helping to understand the meta-categories I’ve come across in my last 9 months of family estate management, and will help us boil down the boxes of Mary’s Life, Joe’s Life (my father), Marg’s Life (my mother), and John & Emily’s Life (my grandparents) into practical-for-enjoying family scrapbooks and files I hope to create in the future. 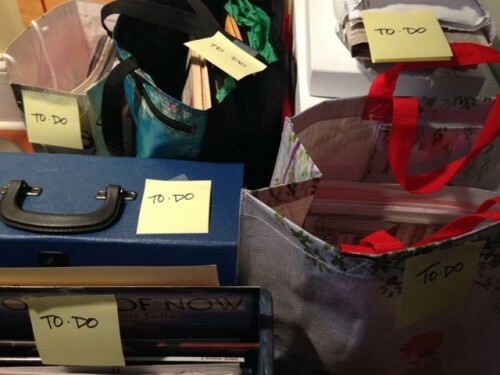 Creating additional labels for Books, China, Stationery, and To-Do also helps to manage these roughly-grouped boxes and bags in their respective corners of the room. Removing three boxes that don’t fit these categories helps to tidy the room for the next organizing session. These solo-sessions are a blessing as much as they have been a painful interaction with my grief. The solo-time allows me to enter emotionally into a deeper-level of grief-process than I allow myself when working with others. I am beginning to understand how the tender work of feeling broken-open will lead in the future to my body-mind-heart-knowing being healed.